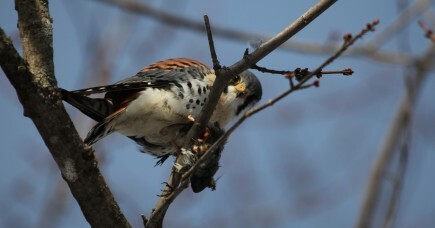 For the past few weeks, I’ve been seeing a kestrel in the park a couple of blocks from us. When we came home from the grocery store Saturday morning, he was sitting in a tree in the backyard eating a junco. 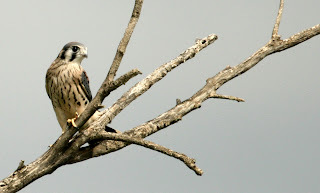 In the world of raptors, the American kestrel seems like a wee one, not particularly scary, but that’s only true if one is not a small bird, rodent, insect, etc. 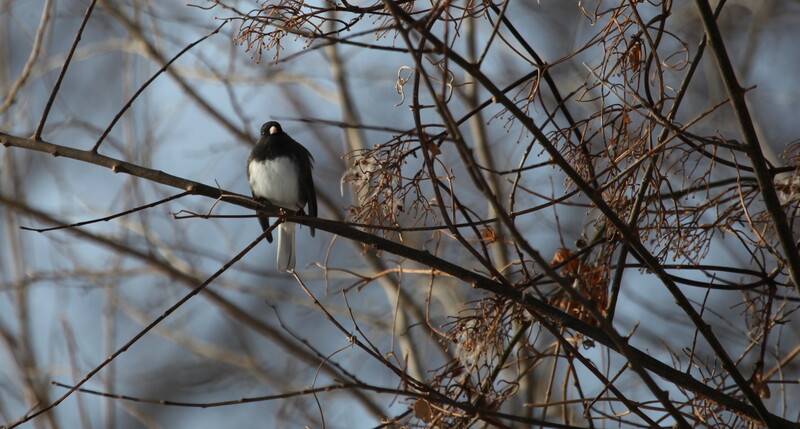 There is certainly a reason they are also called “sparrow hawks.” I know the life of a bird of prey is a hard one, particularly in the winter, but poor little junco! 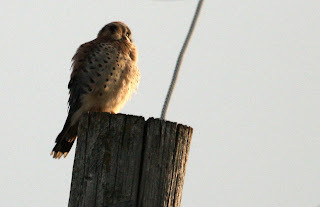 All the small birds in the yard were yelling at the kestrel. I could imagine him saying, “Hey, I’ve got to eat too.” The bluejays were dive-bombing him over and over, but he stayed until he finished his breakfast. What I found really interesting about this is how all the birds worked cooperatively to try and run him off. 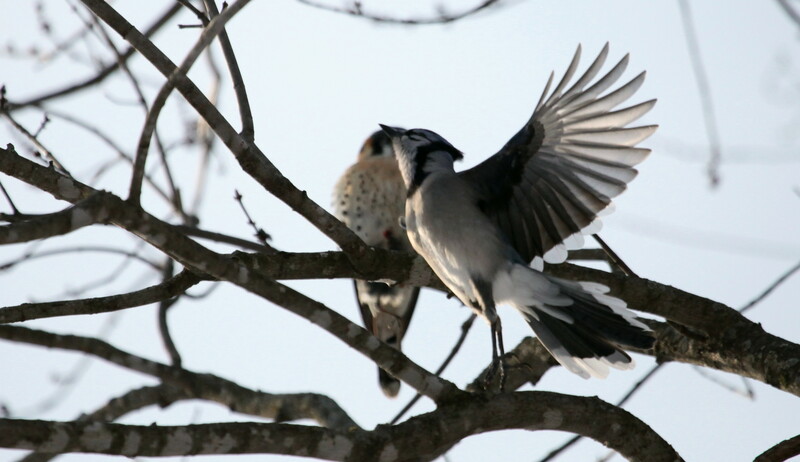 Bluejays are known for sometimes eating smaller birds, but they were quick to join the sparrows and juncos in the fight against the larger predator. Once again, I am in awe of the life and death struggles that take place around we humans that so many of us never seem to notice. I won’t post the particularly graphic pics (I think this one is quite enough). Click on pictures to enlarge. 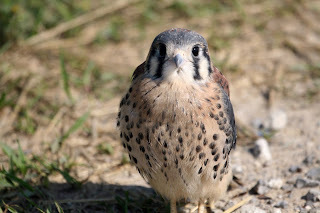 This entry was posted in bluejays, juncos, kestrels and tagged american kestrel, bluejay, dark-eyed junco on January 18, 2011 by admin. Baby birds are everywhere right now. Watch out for them. 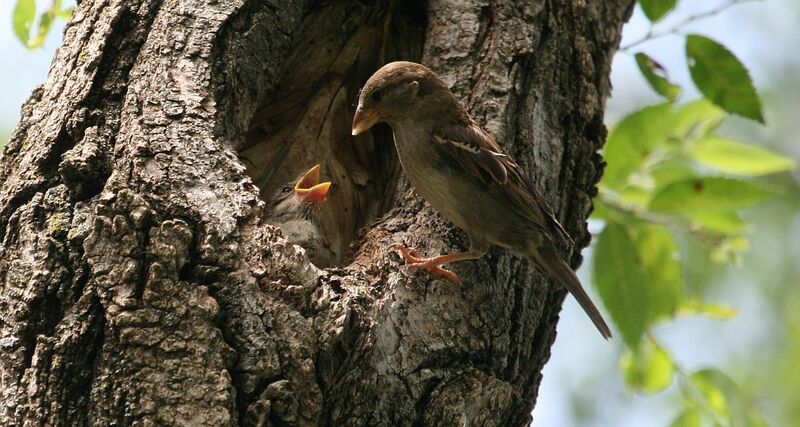 If you find a baby bird, do not assume it needs rescuing. Every year, good intentions separate a great deal of healthy babies from their parents. More often than not, the baby’s parents are nearby and have been feeding her/him. Cornell has some great info on what to do and what not to do. 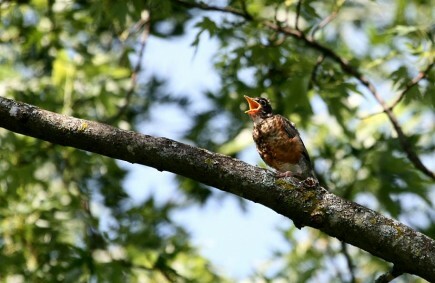 Operation Wildlife advises if you find a baby bird and he or she is hopping, has most of his or her feathers, and has a short tail, the baby is a fledgling still learning to fly. His or her parents are nearby watching, feeding, and socializing the baby. I know it can be hard to resist getting involved. They look so vulnerable, but they need to be left alone so their parents can take care of them. 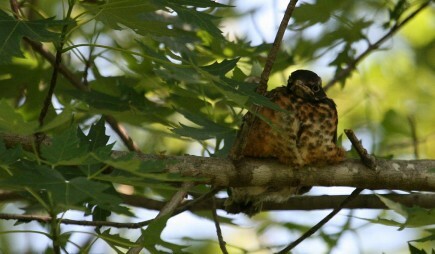 If you are not sure if a baby needs help, call your local wildlife rehab. They will be happy to tell you. This is Operation Wildlife’s busiest time of the year. Donate or volunteer if you can. Join their Facebook page. This entry was posted in fledglings, kestrels, little ones, robins, sparrows and tagged american kestrel, american robin, House sparrow on June 21, 2010 by admin. 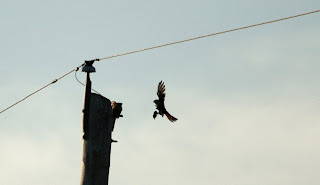 We went by to check on the young kestrels the other day and arrived just in time to see one of the parents delivering breakfast. Click on pictures to enlarge. 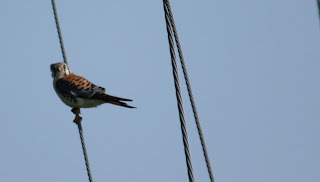 This entry was posted in kestrels and tagged american kestrel, feeding, fledglings, parent and young on June 30, 2009 by admin. 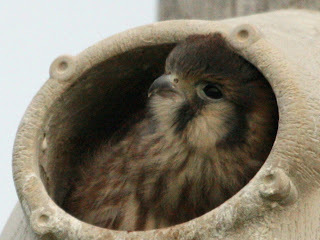 I stopped by to check on the young kestrels a few days ago and everyone seems to be doing well. 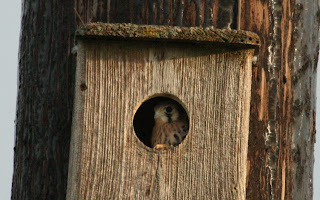 These pics are of one of the parents watching over the young one still in the nest box. Click on pictures to enlarge. 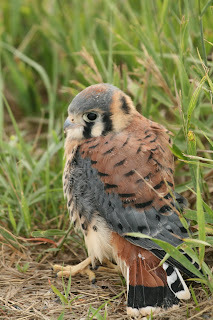 This entry was posted in kestrels and tagged american kestrel on June 19, 2009 by admin. 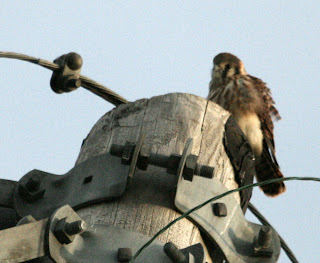 We went back this morning to see how our young friend was doing and found him sitting on top of a pole near the same spot. His sister apparently fledged also. It was great to see them doing well. 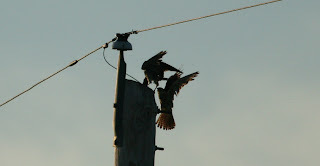 We also saw some activity at the other nest box. Notice the little face peeking out. Click on pictures to enlarge. 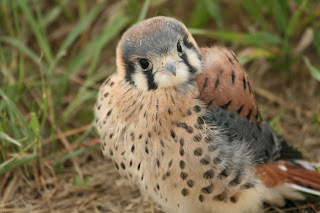 This entry was posted in fledglings, kestrels and tagged american kestrel, fledglings, nest on June 12, 2009 by admin. 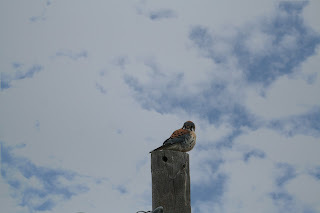 I was on my way back from checking on one of the eagle nests last week when I saw a baby kestrel in the road. At first, I thought he was an injured adult. There are many big trucks that come down this road and I was afraid he was going to get run over. I called Operation Wildlife and the wonderful woman on the line said, “Is his tail about two inches long?” I realized she was asking because he was a baby and his parents were probably around feeding him. I asked her if she thought it would be OK for me to move him into the nearby field so he wouldn’t get hit by a car. She said that would probably be a good idea. I really wanted to pick him up and give him a few pets while I was doing this, but of course, I knew no matter how cute he looked, I could lose a finger, not to mention, terrify him. I grabbed a canvas bag out of the car and used it to scoot him out of the road. He hissed at me a bit, but seemed very curious about what I was saying to him (I was telling him how beautiful he was and giving him a little lecture about staying out of the middle of the road). After I got him into the field, I heard the parents overhead giving me a scolding, so I figured everything would be OK. We went back to check on him over the next few days and realized that the reason he was hanging out in this area, so near the road, was there is a nest box nearby. Sure enough, another baby was sticking her head out watching. 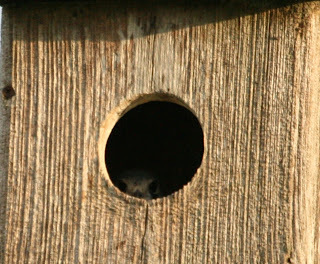 The nest box looked a bit like a phone box, so we hadn’t noticed it before. When we checked on him the last time, he was in the same area, but seemed to be doing a bit more flying. We haven’t been back in several days. I pray that he and his siblings are doing well. We hope to drive back by tomorrow and see if all is well. Click on pictures to enlarge. 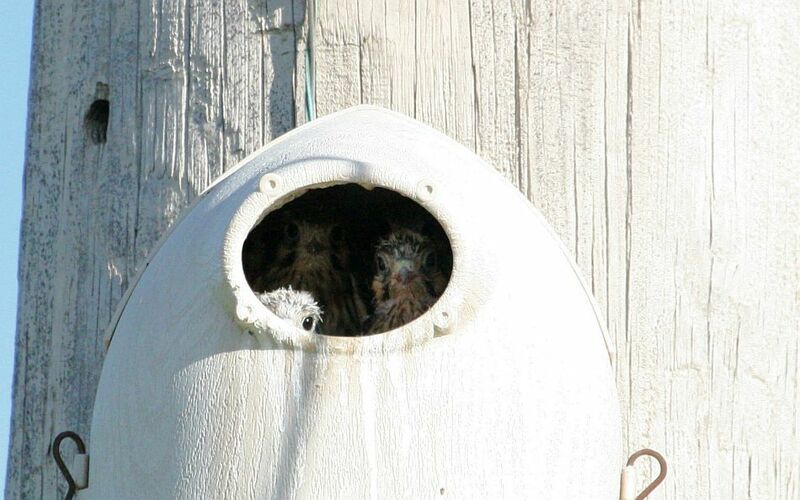 This entry was posted in fledglings, kestrels, little ones and tagged american kestrel, fledglings, impossibly cute, nest on June 11, 2009 by admin. 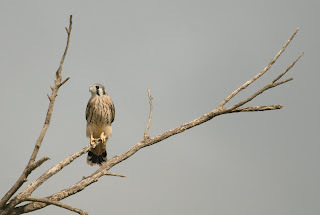 This entry was posted in kestrels and tagged american kestrel on February 9, 2009 by admin. What a treat it was to see this magnificent little bird. Click on photo to enlarge. This entry was posted in kestrels on May 28, 2008 by admin.